8 February 2010, at 8:52a.m. UK - Confidence in the long-term future of the traditional Christmas turkey market – with farm-gate sales 'ticking all the right boxes for consumers' – is expressed by Paul Kelly, managing director of FarmGate Hatcheries in his annual letter to poult customers. Following a Christmas when demand for top end turkeys actually increased despite the recession, Paul Kelly believes that farm-gate sales to the local community remain a growth area. He said: "While we are in recession and going through tough times, collecting the turkey from the farm and meeting the farmer has tremendous perceived value. I would encourage you to study your customer base, get close to them and produce what you know you can sell. Do not rely on maybe selling surplus turkeys at the last minute to fellow producers. "I believe demand for good quality farm fresh turkeys will continue to grow in the long term." Announcing that FarmGate Hatcheries is holding poult prices for this year, Mr Kelly advises producers seeking to save money to opt for 'as hatched' poults. 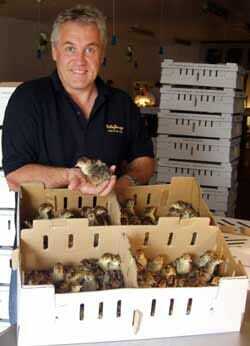 He explained: "The poult price alone amounts to a 20p per kilo saving and the feed conversion on males is also better. From experience a poult order that is about 33 per cent as-hatched and 66 per cent sexed hens will give most producers a spread of weights to supply most order books. "Our breeds of stags fill this gap and most importantly have better eating quality than large strain hens. The small males are also perfect for making jointed products. "The fast growing hens are bred to have very lean meat and because of the fast growth have much larger meat fibres that are very coarser and dry out more easily. Explain this to your customers – they cannot ignore eating quality. The grain and marbling of the meat is totally different." The price list shows FarmGate Hatcheries offering a range of five bronze and four white breeds – the Super Mini, Roly Poly, Wrolstad and Plumpie in both and the Tiny only in bronze. The price list and full details of supplies to all parts of the country are available from Diane Ball, FarmGate Hatcheries at Springate Farm, Danbury, Essex CM3 4EP (telephone: 01245 223581 or e-mail diane@kellyturkeys.com).